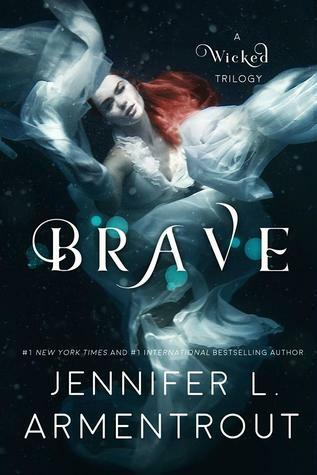 Because behind ever evil fae Prince, there’s a Queen…"
I had really high expectations going into Brave, and this book met every single one of those expectations. I have yet to read a JLA book I didn’t love, but I really think her writing truly shines in her paranormal/fantasy reads. She always balances the romance with the action and fantasy perfectly and keeps the readers engaged and on their toes. Brave delivered some twists and turns along the way that kept me turning pages. I have to start with Ivy because I absolutely adore Ivy. And what I liked most about Ivy is that she dealt with everything she has been through realistically. She has to take time to process everything and really come to terms with the changes in her life, but because she is Ivy and so so strong she pushes through and comes out stronger on the other side. Ivy is determined and tough and doesn’t back down and I love her compassion and her sass. I love how in the middle of a fight she is still cracking jokes and being sarcastic. Simply put, she is a fun and relatable heroine and I love her. Of course I also absolutely love Ren. He is probably one of my favorite JLA book boyfriends to date. He is funny and charming and willing to chase Ivy to the ends of the earth. What I love most though is Ivy and Ren’s dynamic together. They aren’t perfect and they have a lot to work through but their chemistry is insane and they work so well together. Both are willing to go to extreme lengths for one another and it is clear they are crazy about each other. They are both so strong, but together they make one another stronger and I love that. Then we have Tink and Tink is such a scene stealer. He is probably my favorite secondary character in all of JLA’s books (I’m so sorry Deacon I still love you). Tink is just so ridiculous at times and you never know what he is going to do and I just love that about him. I love his love of Amazon Prime and truly relate to that and his pop culture references warm my heart. But I also love that behind his nonsense, he is such a good guy (fae? brownie? whatevs). He wants to fight and he truly loves Ivy. In this one Tink is still his crazy self but we also see another side of him and I loved that. Along with the great cast of characters, the plot keeps moving. This book is really nonstop and I loved how quick it moved. I also loved that it took me by surprise in places. I mean there was stuff that went down that we kinda had to know was coming but then there was stuff that just completely took me by surprise and I loved that. The action was fantastic and intense. And the action was balanced so well with the romance. This is JLA so of course the swoon was off the charts. All in all, Brave was an awesome read and this is definitely one of my favorite of all of JLA’s series. I loved her take on the fae and the way she delivered heart stopping action with a swoontastic romance. I know this is a series I will be reading again and again. While I agree that she really shines in the Para genre, I think I'm just not that into fae, as I didn't love this like I wanted to or should have. Glad you enjoyed it though.